What causes sound? Is it a type of energy that is emitted when objects collide? (actually, that’s an interesting theory, but incorrect). When you hear of sound waves and their having a certain speed, that is a little misleading, and I will tell (I can’t really ‘tell’ anything, as I am typing, and you use light to understand this, not sound as in speech, so, I guess I will, um, ‘type’) you how sound works. Say I have a recorder, and I blow through the mouthpiece. This sends air down a tunnel (B) to an edge (C). This separates the air blown into it, and the air inside the tube is thrown all wild and the molecules start shaking around, while still being being pushed down the tube. If all the holes on the recorder are covered, the molecules stop moving around so much. If only a few holes are covered, then the molecules keep shaking/vibrating. When the air is out of the recorder it continues vibrating, and so shakes the molecules around it, which in turn shakes the molecules around that with the same velocity and shaking as the originals. And so the vibration spreads, all the way to our eardrums, which pick up the vibrations and send the signals to the brain. The faster the vibration, the higher the pitch, and too fast of vibration can break our eardrums, making us deaf (thankfully, it takes a lot of vibration to do that). Have you ever looked at speakers while the sound is on and on loud? The air around the emitters is distorted, as if vibrating, which it is. Also, when objects collide, the air around it shakes with the force, and that vibration force spreads to our ears, which once again pick it up. This entry was posted in Uncategorized on July 27, 2012 by Captain Belaq. Yesterday I had another silversmithing lesson, this time on lost-wax casting, which you all know as the process where the object intended is carved out of wax, plaster is poured around the wax, the wax is melted out, leaving an empty mold where the wax was. Then molten Silver is poured into the mold, the silver hardens, and you break open the plaster mold to reveal the silver whatever-it-is-you’re-making. In my case, it was a mens ring (for me, this time). Men’s rings are thin at the bottom, and gets considerably thicker as it goes up, up to an inch wide at the top, where normally a single stone is embedded and held in place on all sides rather than by a few prongs. This ring I carved in a style called the Nugget Style. It is so called because of the bumps, ridges and dips all over the front and sides of the ring, simulating a gold nugget. Mr. Wade had me use this style because you could do random things, nothing has to be uniform, and so it is much easier. Because it takes a few hours for the plaster to dry, we could not do it all last night, so next lesson, he will show me how the pouring works, the centrifugal force machine, and lot’s of other interesting things. And, once it is done, I will post a photo of it. This entry was posted in Uncategorized on July 24, 2012 by Captain Belaq. Hey! My Metal is burning! Pewter melts at approximately 400 degrees Fahrenheit, so what I like to do is fool around in the garage with a blowtorch (well not ‘fooling around’, I am very careful), melting it, trying to cast it, it fails, I melt it again, and so on. I have limited amounts of of pewter, and every time I melt it, I lose a little. Why? Because some of it burns away, and that is very annoying. Pewter does different things at different temperatures. Room temperature it’s solid, around 400 degrees it’s liquid, and just above that, it burns up. Remember my post on fire? When something burns, it means that that thing is very rapidly oxidizing. When some things reach a certain temperature, they grab on to Oxygen unusually fast. That is where when I am melting pewter, I have to be careful not to keep the torch on it too long, or the pewter that is exposed to air grabs on to it, and the outside literally turns to dust. I could try separating out the Oxygen from the burned pewter by smelting, but it may not work, because pewter is an alloy (a combination of two or more different metals) and if it did, it would be a lot of work for a very small reward. Everyone has heard of Titanium, the “space-age metal that is super strong and light, but is very rare.” Well, not all of that statement is true, as Titanium is 100 times as abundant as copper. Unfortunately, smelting it is not so easy as mining it, because the point at which Titanium melts is very close to the point it burns, so to smelt it, it has to be done in a vacuum, where there is no Oxygen to grab on to (very expensive), or under inert gas (also very expensive). Unfortunately, the blowtorch is out of propane, so I cannot take any pictures of the pewter in the process of burning, but I will try to take one when I get a chance. This entry was posted in Uncategorized and tagged Burning, casting, Metal, pewter, titanium on July 16, 2012 by Captain Belaq. Obsidian is basically a natural glass, has a fairly soft hardness of 5-6, is semi-easily breakable, and most of all, has that glassy black color that draws you in. The first stone I ever cabbed was Obsidian, and it has a swirl of purple and green you can only see in sunlight. 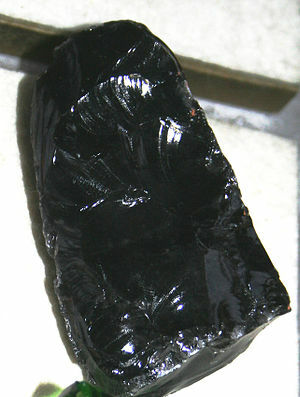 Most pieces of Obsidian have no color (other than black, of course), whereas some have much more color than others. The ones that have different colors regularly layered inside the stone can be cut so the bands appears to form a heart: The stone is cut in a regular cabochon, so as it slopes down it looks like circled bands around the center which is the highest point. The only exceptions is that a shallow ditch is cut at the top and a small ridge is left a the bottom. This gives the impression that the layers are naturally in a heart form. 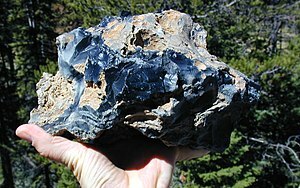 One more interesting thing about Obsidian is that when is fractures, it fractures polished, so the rockhounds who mine it know exactly the colors and quality, as well as picture in their mind what the finished cab will look like. 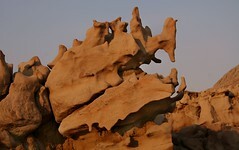 This entry was posted in Uncategorized on July 10, 2012 by Captain Belaq. There are several different methods that silversmiths use to create their pieces. Every silversmith has their own methods and trade secrets. In fact, methods can greatly differ from smith to smith, and I am going to describe the two ways that I have been showed. According to the person who first introduced me to silversmithing (pictures here of that lesson), three different solder types are used: Hard, Medium, and Soft. These are so called according to their melting temps. These are used so that when the torch is being used to melt one piece of solder, it will not melt a different piece that has already been used. For example, to solder the bezel, (the strip of silver that holds in the stone) hard solder is used because it melts at a relatively high temperature, and when soldering the bezel to the plate, medium solder is used. This makes it so the medium solder melts and runs before the hard solder: if they both melted at the same time, the solder at the seam of the bezel would run off, and it would look like a crack in the bezel. The style that my current teacher uses is different. He only uses one type of solder, but, to make up for that, he uses something called flux. Flux is a type of paste that sort of attracts the molten solder, so before soldering a joint, he first spreads a little flux on top, then gently holds the torch over that spot. The flux begins to sizzle, then starts to get hard. Right at that moment is when he applies the solder. For a second he moves away the torch, puts a bit of the solder in place, and then re-applies the torch, melting the solder where it flows immediately the joint. There are different methods, one is not essentially better than another, but I am discovering that every silversmith has their own little style. This entry was posted in Uncategorized and tagged Silver, silversmithing on July 9, 2012 by Captain Belaq. There are three main types of Rock, Igneous, Sedimentary, and Metamorphic. Before I get around to telling you what those are, first let me tell you what a rock is. 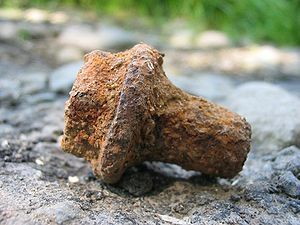 In general, people think that a rock is just another word for a mineral. WRONG. A mineral is a solid naturally occuring substance that always has the same amount of the same element, such as quartz is always two parts Oxygen to every one part Silicon, whereas a rock is a combination of different minerals, with no uniform formula. And a stone is a word that refers to rocks, minerals, and gems. Igneous. Let’s say a volcano erupts, and lava starts oozing over the ground. This can turn into different types of Igneous rock in many ways. If the lava flowed into a pool of water, it would cool super quickly, and turn into a sort of glass that we know as Obsidian, a stone that fractures into very sharp points and so was used by the Indians to make their arrowheads. 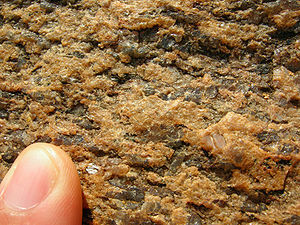 If the lava was flowing around a lot and was frothy when cooled, you have Pumice, the only stone that can float on water, used by silversmiths for a surface to do their work on because it retains heat.For Granite, the lava cools very slowly, letting the contents crystallize, cementing each other together. A good example of this is Granite (first photo). Sedimentary. Now, take the granite, and we say it falls from the now-cool volcano into the nearby river. The river tumbles and grinds the Granite into sand, which it deposits. This sand keeps on piling up on itself, gradually compacting itself together into a hard substance. This substance is hard, yet easy to carve and cut through. In fact, in Lamanon, France, (where my grandparents live) there is a mini village carved out of sandstone! Metamorphic. Meta means change, and Morphe means shape, structure, or form. So Metamorph means change in form. 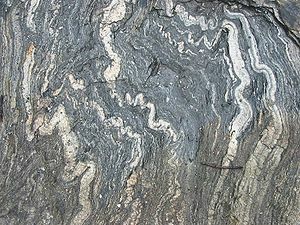 Metamorphic rock is formed when any other rock or combination of minerals are forced underground and compressed with immense pressure and changed, so the rock is basically baked compacted into hard form. Gradually movements in the crust can bring the rock to the surface, where we admire and study it today. In fact, what we know as Marble (not the little glass balls, the stone) is Metamorphosed Limestone, which is Sedimentary. Now remember what I’ve wrote, memorize it, and go correct whoever calls your Emerald a “pretty rock”. Tell them that an Emerald is actually a mineral, as it has a regular elemental composition, and so is way better than a chunk of different minerals cemented together. This entry was posted in Uncategorized on July 5, 2012 by Captain Belaq.